Georg Janny (1864–1935), The Wilde Kaiser at Kufstein (date not known), watercolour on paper, 20 x 22.5 cm, location not known. Wikimedia Commons. In the 1860s, Vienna saw the birth of a new industry: with the building of what is now the Vienna State Opera (then known as the Vienna Court Opera), many businesses became involved in its lavish productions. Among them was the firm of Brioschi, Burghart and Kautsky, which made and painted theatre scenery. It was so successful that it drew customers from outside Europe, among them the Metropolitan Opera in New York. The senior artist in the business was Carlo Brioschi (1826-1895), the son of another Viennese scenery designer Giuseppe. Carlo trained at the Academy of Fine Arts in Vienna, and started work for the Vienna Opera in 1856. Carlo Brioschi (1826-1895), Old Castle at the Foot of the Alps (1886), oil on paper, dimensions not known, Private collection. Wikimedia Commons. Although few of his paintings survive, Carlo Brioschi was clearly a thoroughly proficient painter. 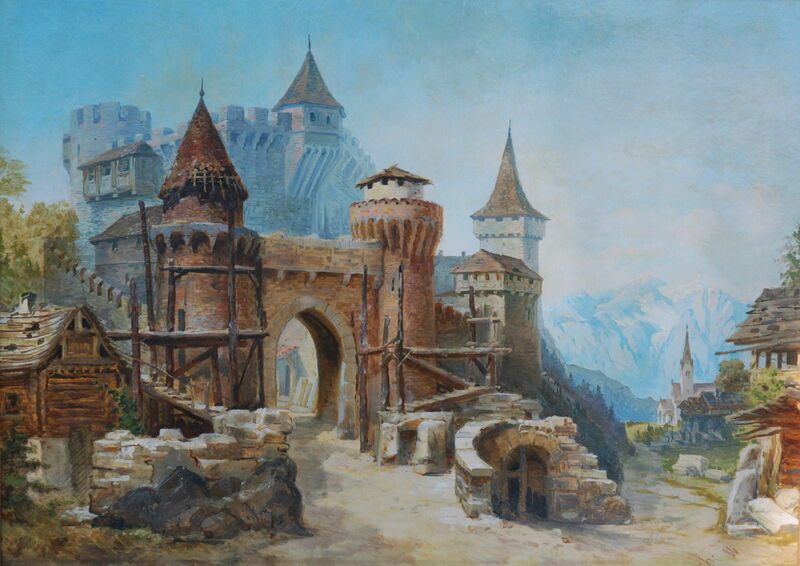 His Old Castle at the Foot of the Alps (1886) shows a preference for the sort of view which his firm might have painted for a client’s theatrical production. His business partner Johann Kautsky (1827-1896) was Czech by birth, also known as Jan Václav Kautský. He had trained at the Academy of Fine Arts in Prague, then in Düsseldorf under Johann Wilhelm Schirmer. He started work as a scenery designer in Prague in 1851, and in 1863 was appointed decorative artist to the Vienna Court Opera. Brioschi, Burghart and Kautsky was established as a business in 1864. 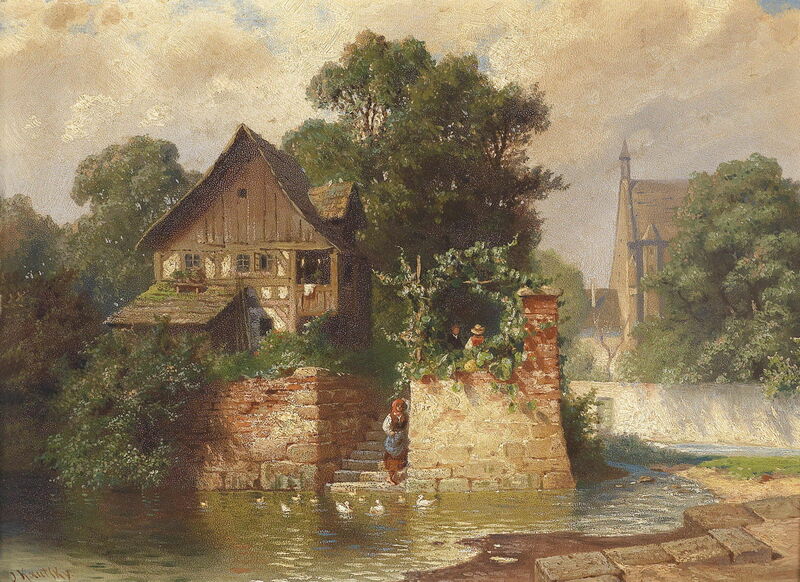 Johann Kautsky (1827-1896), Idyll by the Moat (1864), oil on cardboard, 24 x 32.5 cm, location not known. Wikimedia Commons. Kautsky continued to make paintings, among them his Idyll by the Moat (1864), which shows similar style and preferences to those of Carlo Brioschi. Whilst Brioschi and Kautsky are unlikely to be remembered for their art, they employed several painters who went on to become more famous in their own right. The best-known is Alphonse Mucha (1860–1939), whose Art Nouveau paintings and prints remain quite popular today. In his day, though, Mucha was also famous for a series of vast paintings which showed key events in the history of the Czech people. 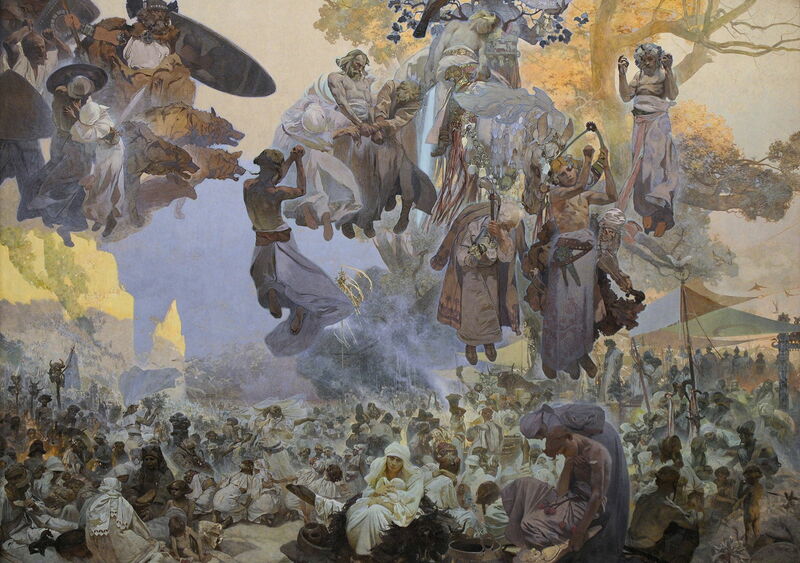 Alphonse Mucha (1860–1939), Slavnost Svantovítova: Když jsou bohové ve válce, pak je umění spásou (The Celebration of Svantovit in Rujana: When Gods Are at War, Salvation is in the Art) (1912), oil on canvas, 610 × 810 cm, Galerie hlavního města Prahy, Prague, The Czech Republic. Wikimedia Commons. Among those is this epic work showing The Celebration of Svantovit in Rujana: When Gods Are at War, Salvation is in the Art, which he completed in 1912. Mucha was a gifted singer, and lifelong friend of the composer Leoš Janáček. He started work, though, as a decorative painter, and in 1879 moved to Vienna to work for Brioschi, Burghart and Kautsky. In 1881, he returned to Moravia, and was eventually sponsored to attend the Munich Academy of Fine Arts. 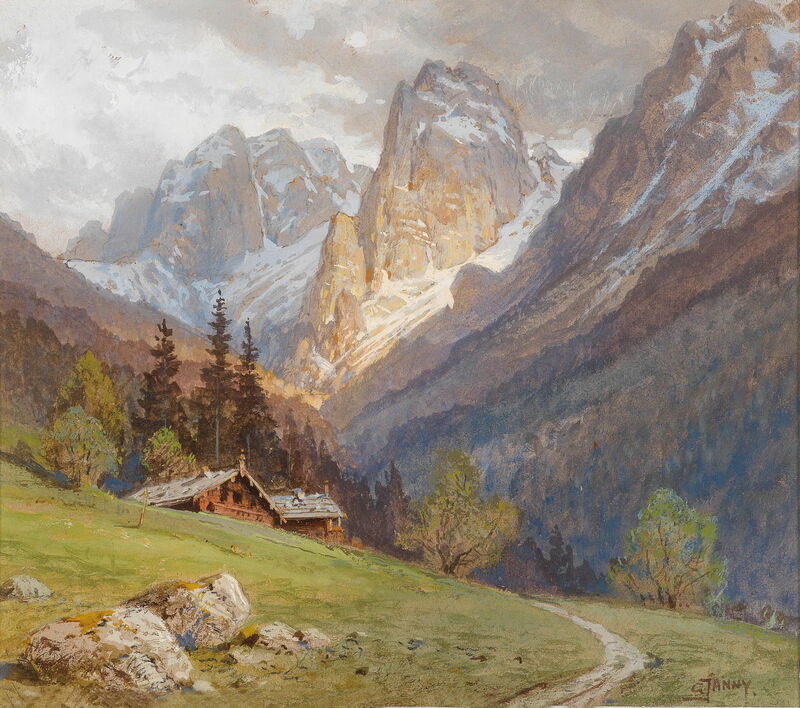 Another less well-known painter was the Austrian Georg Janny (1864–1935). He seems to have stayed with Brioschi, Burghart and Kautsky much longer, and was one of the artists responsible for painting the famous ‘Iron Curtain’ to celebrate Emperor Franz Joseph I’s fiftieth jubilee in 1898. Janny went on to greater success as a painter, exhibiting in the Austrian pavilion at the St Louis World’s Fair in 1904. 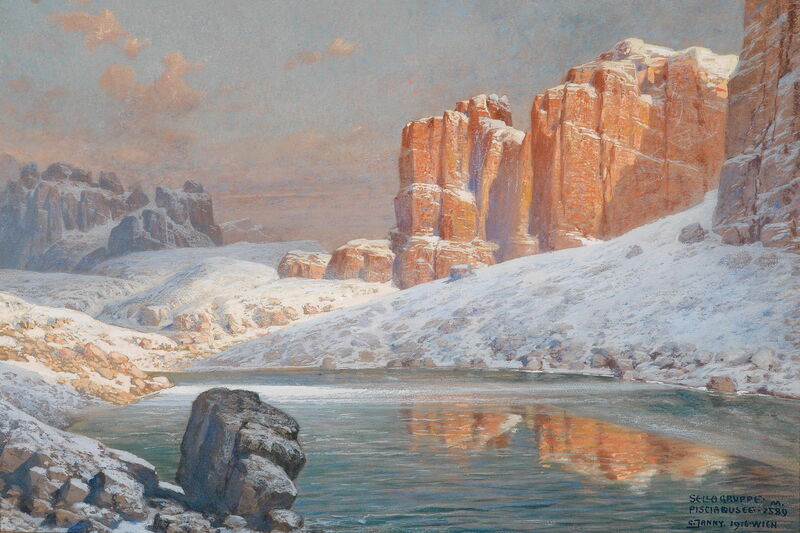 With his background as a scenery painter, Janny also like painting the dramatic scenery of the Alps. Georg Janny (1864–1935), View of Ramsau near Berchtesgaden (date not known), mixed media on cardboard, 60 × 44 cm, location not known. Wikimedia Commons. 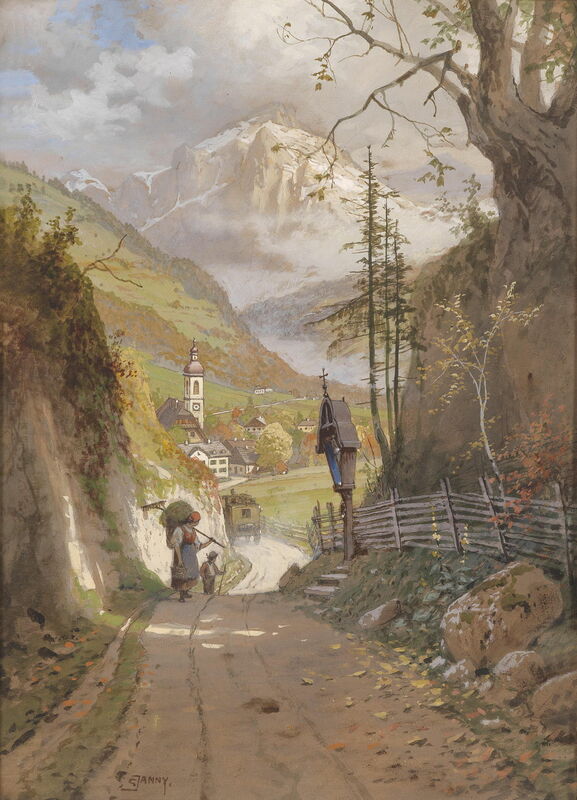 His undated View of Ramsau near Berchtesgaden shows this rural village in the German Bavarian Alps, with the looming massif of the Watzmann in the far distance. Georg Janny (1864–1935), The Sella Group and Lake Pisciadu (1916), watercolour on paper, 39 × 59 cm, location not known. Wikimedia Commons. Janny also crossed the Alps to paint views of the Dolomites, including this watercolour of The Sella Group and Lake Pisciadu which he made in 1916, half way through the First World War. Another undated watercolour shows The Wilde Kaiser at Kufstein in the Austrian Tyrol, over the other side of the border from Berchtesgaden. Janny’s mind wandered beyond the mountains in front of him, and he started to populate them with mythical creatures. It had been done before, of course, from the Renaissance onwards, but more usually invoked some classical Greek or Roman myth. 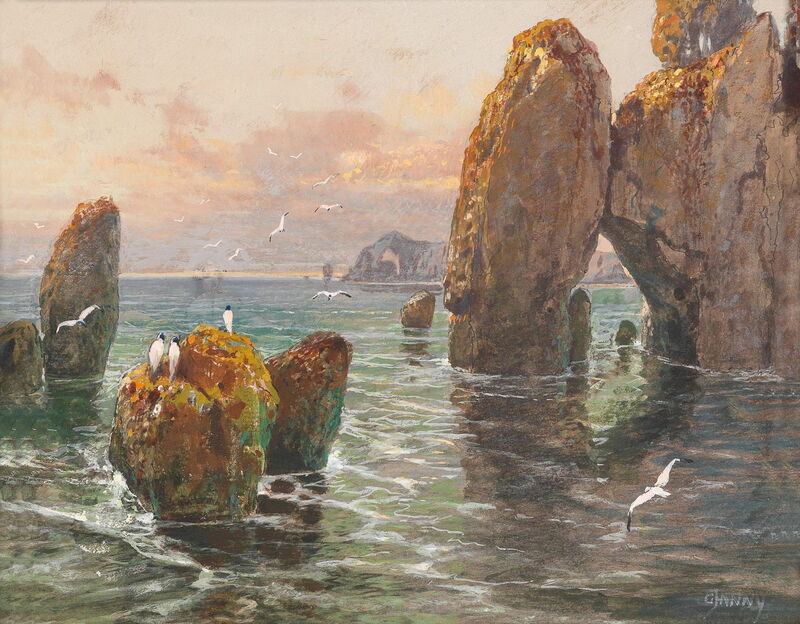 Georg Janny (1864–1935), Rocky Coast (Merres-Joille, Evening) (date not known), watercolour on cardboard, 22 x 28 cm, location not known. Wikimedia Commons. 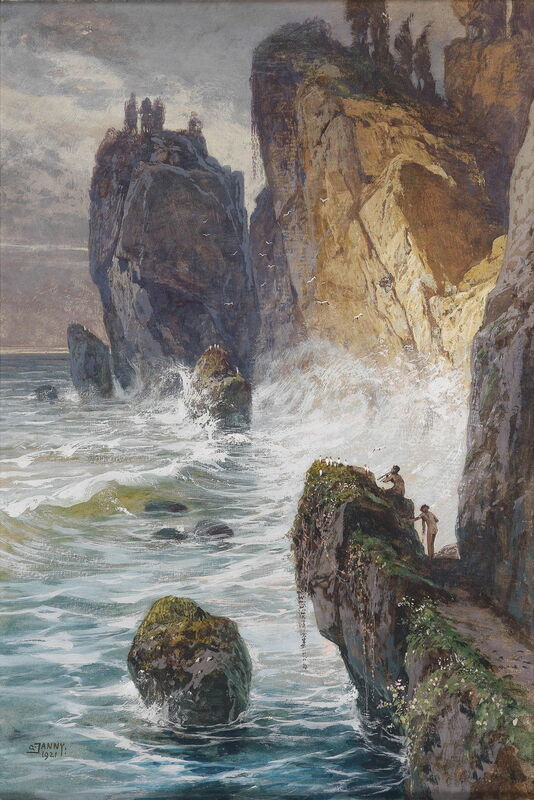 Some of his landscapes, such as his undated watercolour of a Rocky Coast, which he seems to have titled Merres-Joille, Evening, are what today might be termed fantasy art. 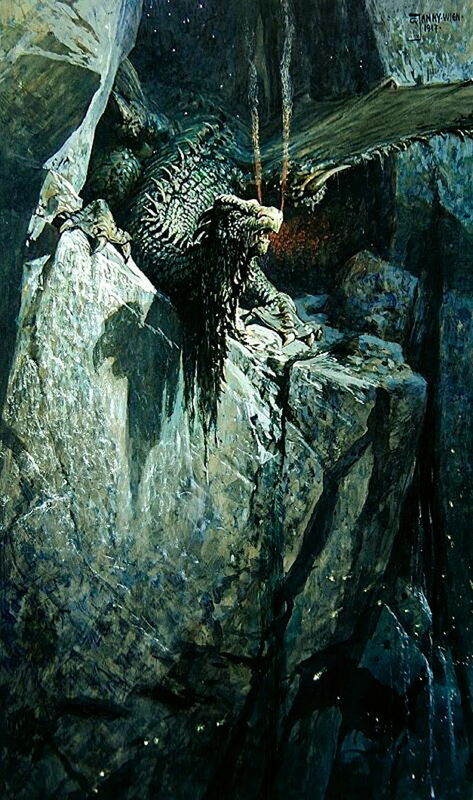 Georg Janny (1864–1935), The Dragon’s Cave (1917), oil on canvas, further details not known. Wikimedia Commons. His mountains now appear to be in another world, with flights of the imagination such as The Dragon’s Cave (1917). Georg Janny (1864-1935), Elfin Games (1917), further details not known. Wikimedia Commons. 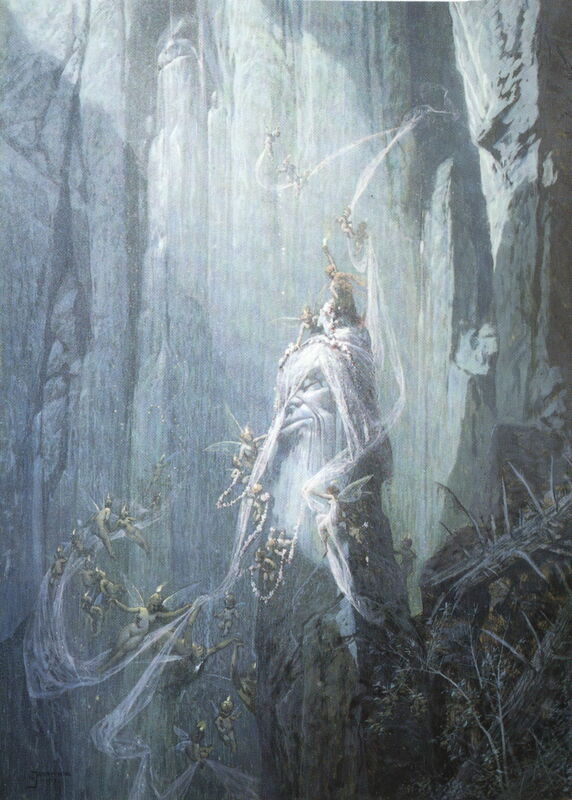 In other paintings, faerie creatures cavort through the air in their Elfin Games (1917). 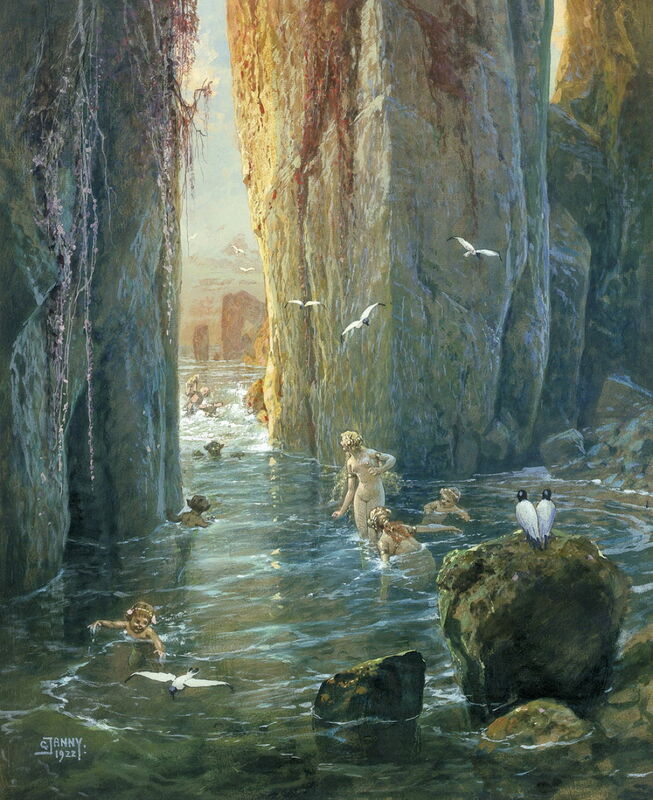 Georg Janny (1864–1935), Mythological Scene with Fauns on a Rocky Coast (1921), watercolour on cardboard, 50 × 33 cm, location not known. Wikimedia Commons. Elements appear to have been drawn from classical myth, such as the fauns in the foreground of his watercolour of a Mythological Scene with Fauns on a Rocky Coast (1921), but don’t appear to relate to any conventional or established mythical scene. Georg Janny (1864–1935), Sirens Bathing by the Sea (1922), gouache on cardboard, further details not known. Wikimedia Commons. Even the seabirds in his Sirens Bathing by the Sea (1922) appear to be from another world. Later in the twentieth century, fantasy art or fantastic art became very popular. Yet few seem aware of the pioneering work of Georg Janny, and the role of those scenery painters to the Vienna Court Opera, in all the wonderful fantasy album covers and posters which we have enjoyed. Posted in General, Painting and tagged Brioschi, fantastic art, fantasy, Janny, Kautsky, landscape, Mucha, painting. Bookmark the permalink.